I have posted this before/after image few day ago on our Instagram, and since there are few people there interested to learn how I blended the sky and get this beautiful dramatic, golden hour effect, I'm sharing one more free tutorial today. This picture is from one of my Winter sessions, this is how December mornings looks like here in England. I was pretty happy with my clean edit and all the English/rainy, foggy mood, but I thought I would try more dramatic edit. My first step was clean edit and here I haven't done much - just change the contrast a little and boost the mid tones (opacity 30%) with Mid tones PS action from Annabella PS Actions Collection. The picture changed the look for slightly warmer already, but this is not the look I was hoping for. For this edit I picked one of sky overlays from Scottish Sky Overlays pack. 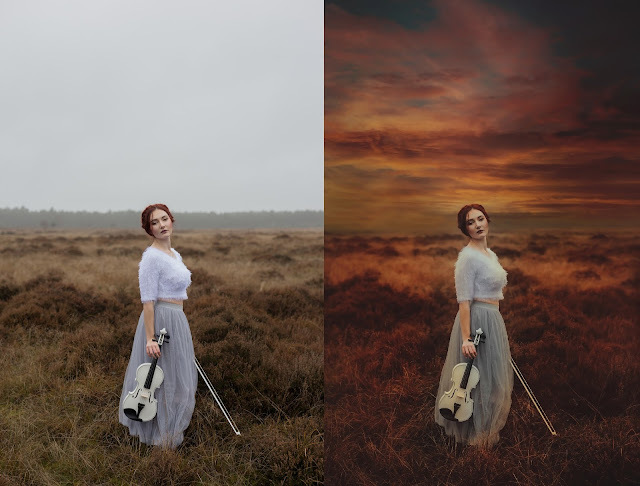 If you wonder how to use sky overlays, please check this free tutorial here. I changed mode of the Sky Overlay for Multiply and mask off with the black soft brush some parts of the overlay (over the model, model face etc.). To give this picture more golden hour, honey and brown look I used two actions from the Annabella PS Collection - Soft Sunshine and Warm & Rich. You can also get this look by using Annabella Golden hour PS Actions - free tutorial here. If you like textures you can check this Afternoon Light Free tutorial here . At the end I run free Matte Action, you can check another free tutorial how to create Matte look in Photoshop here. Hope you will find this tutorial helpful.